I was fortunate enough to be in a viewing blind along the Platte River last Friday and Saturday nights, watching sandhill cranes coming in to roost. Both nights had fantastic weather, beautiful sunsets, and excellent opportunities for our guests to see cranes up close. However – there was a huge difference between the two nights in terms of the number of cranes that came in to roost. On Friday night, we could probably see around 30,000 birds from the blind I was in. On Saturday, the number was probably down around 5,000. Sandhill cranes at sunset on Friday night. As the sun went down, the numbers of cranes on the river went up. I'm not an expert at estimating numbers, but I'd guess there were at least 30,000 birds within view of the blind. A big contrast to Saturday night - though Saturday night was nothing to sneeze at, with birds landing close to the blind and a fantastic sunset as well. It looks like this year’s early arrival of cranes on the Platte is leading to an early exit as well. Normally, the 24th of March (Saturday’s date) sits right at, or shortly after the peak time to see sandhill cranes on the Platte. Even if some of the early arrivals have started to head north to breed by the 24th, the numbers are still very high in most years. This year, it was as if someone opened the gates and let them out Saturday morning, and they all rushed north at the same time. Don’t get me wrong, there are still enough cranes around that driving the roads during the day and watching them come to the river at night are fantastic experiences. It’s just different than it was during the 2-3 weeks leading up to last Friday. It was especially interesting to be in the same viewing blind the night before and the night after the big departure that apparently took place during the day on Saturday. Saturday was one of those days everyone wishes for on a weekend. The temperature got up into the low 80’s (normal highs are 55 degrees F this time of year) with sunny skies and light winds. Before heading to the blind, I spent the day working in the garden and playing baseball with my kids in the backyard. It’s exactly the kind of day I expect cranes to leave and head north – except that it was a week or two before I would typically expect a mass exodus. However, Friday’s weather was almost identical to Saturday’s weather, so why did they leave Saturday and not Friday? On both days, we watched as groups of cranes spiraled up into the sky, riding the warm air currents until they were almost out of site. On Friday, most of them must have come back down to roost on the river on more time, but on Saturday, they apparently got up high, liked what they saw/felt, set their wings, and glided north. Maybe the high air currents on Saturday were coming from a different direction (south, presumably) than they were on Friday. Maybe they used Friday as a practice day and the itch was unbearable two days in a row, so they gave in and headed out. Going north early can be a risky venture for breeding cranes. The primary role of the Platte River as a spring staging area is to allow cranes to build fat reserves while feeding on waste corn and invertebrates. Those reserves are important because once they head north they typically have fewer opportunities to feed as they are busily setting up nesting territories, laying eggs, and caring for their young colts. Heading north early means they are more likely to find breeding areas that are still frozen and inhospitable. That can lead to additional stress, less food availability, and a greater chance that things will go badly during the nest season. Waiting a couple weeks gives them some insurance that conditions will be better in the nesting grounds when they arrive. So did the cranes that left on Saturday know something? Did they leave simply because they’d been on the Platte long enough to fill up with food and energy? Or are they somehow picking up cues that make them feel good about the weather they’re heading into up north? I don’t have the answers, but I was glad to be an observer when they made their choice. 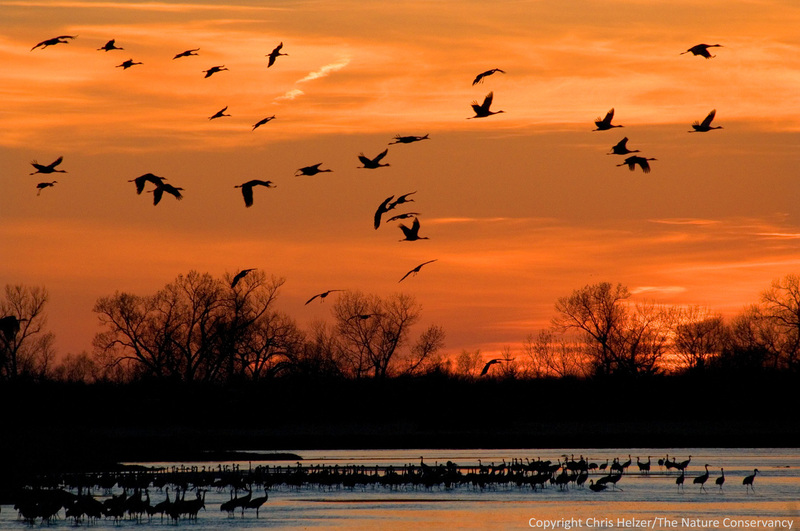 This entry was posted in General, Prairie Natural History, Prairie Photography and tagged migration, nebraska, platte, platte river, roost, sandhill cranes, staging area by Chris Helzer. Bookmark the permalink. I saw them leaving on Friday. There were several hundred getting up in to the upper atmosphere and going north. There was a high pressure bubble that came in to the area to help them along both friday and saturday. These critters know far more about weather than we will ever know!! And they saw something! Today I went out to do a survey and in the area you have me watching….and….oh…it was raining cranes at 11am. More cranes than I have ever seen comming in to this area. I dont know if they were hiding in the bottom lands from the high winds or what. I sure was!!!! They are still around, in great numbers, but their behavior says they are going to head north soon. Very soon. Interesting, the birds seem to know what the weather is going to do without the high-tech instruments that the rest of us rely on. I enjoy reading your posts, very interesting and informative. In southern Manitoba, cranes have been seen/heard for the past week or so. We have had amazing weather in March, many days with above normal temperatures and have been free of snow for a while. Frogs have been calling since last Monday in southeastern Manitoba. Unless we get a cold snap, and anything can happen, the cranes will find plenty of fields and opened water for feeding. Christie – this is great information, thank you. I’d looked at some weather info up there and thought it looked as you described, but it’s hard to tell from weather data. Much better to hear it from a resident! Enjoy our/your cranes! I talked to a friend of mine here in NW Indiana and he said that some of the sandhills didn’t leave the area at all this winter. We saw cranes overhead last weekend in northern Texas. This is a year of new experiences.